The ideal starter for a meal is light and refreshing, something to whet the appetite for the main meal. Ideally, it will be easy to prepare and capable of being made in advance. Fruit is a good, low calorie food and using it at the start of a meal is a good way of helping towards the recommended 'five-a-day' portions of fruit and vegetables. We have year-round supplies to chose from and the fruits are made even more tempting and appetising when combined with a variety of other ingredients. Shellfish, too, are low fat and low calorie and make popular starters. This recipe for a tasty, low calorie starter is not too filling. It has 165 calories per serving and is high in protein from the scallops and high in iron from the scallops and spinach. Trim the mange tout and blanch in salted, boiling water for 2 minutes. Drain and refresh in cold water. Wash and dry the lettuce and spinach leaves and divide into six small plates with the mange tout. Cover and chill until required. Peel the ginger and slice it into very thin strips. Blanch them by plunging into boiling water for 30 seconds then into ice cold water. Drain and dry. Mix olive oil with the soy sauce. Cut large scallops into three but leave small ones whole. Pour the sherry into a small saucepan and bring to the boil Add the scallops, cover and cook for 2 minutes or until they are just cooked, shaking the pan continually. Remove the scallops and divide between the plates. Scatter ginger strips over the scallops. Add 3 tbsp of the liquid in the pan to the soy sauce mixture. Shake well, pour the dressing over the servings and serve at once. At only 83 calories per serving, this fruit starter is ideal as part of a low calorie diet. Scoop out the seeds from both melons and carefully remove the skin. Cut the melon flesh into thin strips or slices and place in a bowl. Pour over the wine and enough rosewater to taste. Mix together gently, cover and leave to chill in the fridge for at least 2 hours. Halve the strawberries and carefully mix them into the melon. 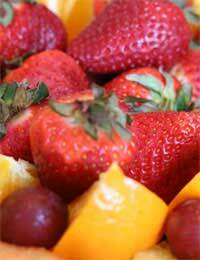 Allow both fruits to stand at room temperature for about 15 minutes for flavours to develop. Arrange on individual plates and add a garnish of rose petals if desired. The delicious wafer-thin, low fat, dry-cured prosciutto ham makes an appetising, low calorie starter. Peel, halve and core the pears. Cut each half into slices and brush them with a little vinegar. Beat the cottage cheese and mix in the remaining vinegar. Arrange the ham, pears and cheese on the plates. Add pepper to taste and garnish with lettuce. Total calorie count is around 135 per serving. This low calorie appetiser is a healthy mix of fruits and flavours. Toast the coconut in a dry frying pan over a low heat until it is golden brown. Put to one side. Core and dice the apples and chop the celery finely. Plunge the dates into boiling water, drain and chop finely. Combine the apples, celery and dates in a mixing bowl. Add the yogurt, seasoning and nutmeg so that the food is coated completely. Transfer to a serving bowl and garnish with the toasted coconut. Serve at once.